Food Guru's blog features foodie adventures, cooking, travel, and creative short videos. Many San Franciscans or Bay Area urbanites may think that Point Reyes Station and Petaluma are quiet farming and ranching communities. In fact, a million tourist travel each year to Point Reyes National Seashore. 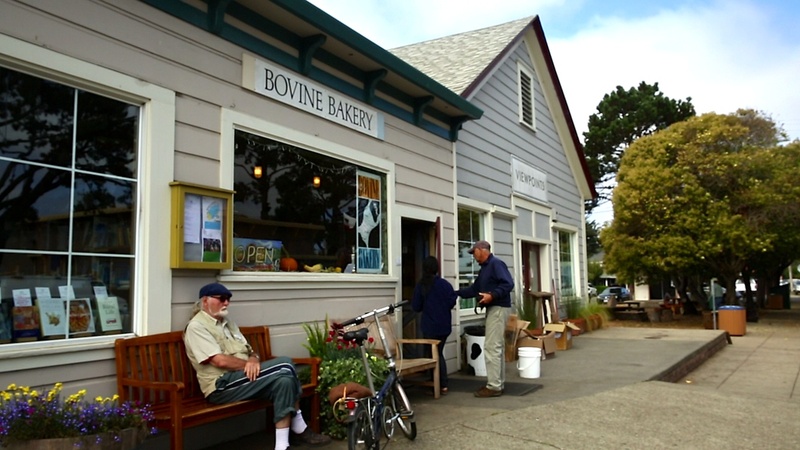 “Stop by Bovine Bakery in Point Reyes Station (about 848 residents) on a sunny summer’s day, and this town can look like Coney Island,” explains Bridget Delvin, the owner. Watch the Video Story HERE. About 25 years ago, Bridget with her first husband and her young son, moved from Santa Cruz to Point Reyes Station. Bridget’s love for baking began when she was a child and these memories inspired her. On a whim, she opened up a bakery in this sleepy, little town, where there were only 2 restaurants and a couple of bars. Bridget shared a recent story on a customer reminiscing about the days when Bridget would wheel around racks of baked goods and hand out free pastries before opening Bovine Bakery. Mentored by her good friend Kelly (proprietor of Kelly’s French Bakery in Santa Cruz), Bridget had the support, entrepreneurial assistance, and gumption to awaken the Point Reyes’ region with the aroma of her organic, fresh baked pastries. Although Bridget has delegated much of her day to day tasks to her devoted, hard working staff, she still squeezes out those creative juices on her favorite day of the week, Tuesdays. Farmers are minutes away from the doorstep of Bovine Bakery. Bringing in the freshest of produce, Bridget goes wild in the kitchen creating new spin offs of the favorite pastries and pizzas. Three years ago, Bridget and her stepdaughter, Carolyn, collaborated to open a new Bovine Bakery in downtown Petaluma. The discussion started around the downturn the economy, which forced Carolyn out of a job as a linguist. Bridget and Carolyn had fond memories of a teenage Carolyn baking and working behind the counter of the Point Reyes Station store. Although many residents of the Petaluma store knew about the Bovine Bakery in Point Reyes Station, Carolyn was surprised their recognition wasn’t greater. Since opening the new location, Carolyn has worked hard to develop and nurture the reputation of Bovine to extend from Point Reyes Station to Petaluma. You can even find her on most days of the week waking up at 3:30 am to bake, at 5:30 am to prepare the cafe, or in the afternoons serving customers. With a population of over 50,000, Petaluma is also one of the oldest towns in California. Once coined the “Egg Capital of the World,” Carolyn’s customers range from Wine Country tourist to local business folks. Many of the popular pastries from the Point Reyes Station store have became instant successes at the Petaluma shop. Recently, Carolyn has taken on catering pies and unconventional style cakes for weddings. With their salads, rice bowls, and pizzas, the Bovine Bakery in Petaluma has been drawing hefty lunch crowds, too. Both Bovine Bakery locations wholesale their pastries and breads to local cafes and restaurants. Bridget and Carolyn’s love of baking and creating new flavors of croissants, scones, muffins, desserts, and pizzas has allowed for them to grow a stronger bond as well as make Bovine Bakery an establishment in their respective communities. Locals and tourist continue to flock to Bovine Bakery for authentic, home-baked feed.